I love South Park. I think it's one of the best, funniest shows out there. It takes topics that are happening right now and totally pokes fun at it. It's freakin hilarious. 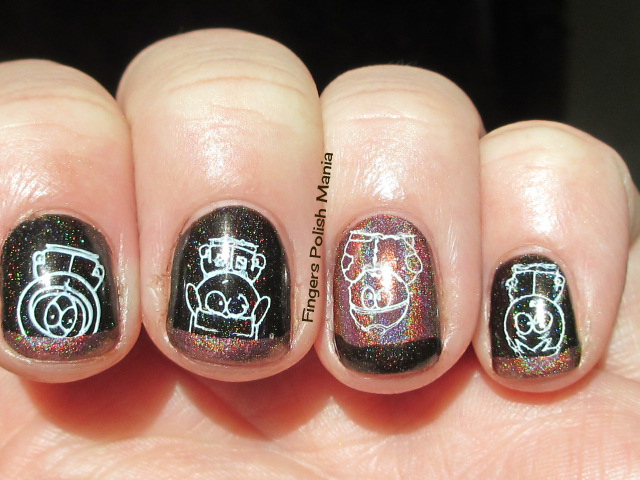 I have been wanting to do South Park nails for a long time. I had the FUN2 plate that only had one character on it, but recently FUN11 came out with the other 3 main characters plus Butters, who is my personal favorite. I was all sorts of excited. Imagine my chagrin, when the plates really didn't work that well and kind of ruined the whole moment for me. 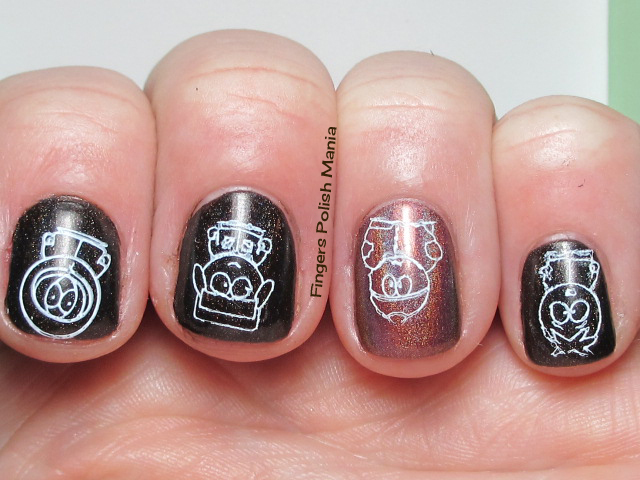 You all know that I am the self professed stamping queen and can stamp with any normal polish. Well not with this plate. I really need to email Llarowe and let them know. Maybe I'll do that after I write this. I had such a hard time using this plate. I had to redo several nails and you know how I loathe to do that. 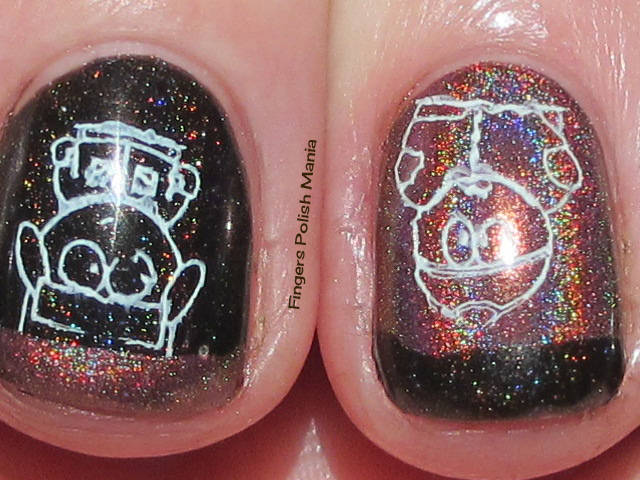 I was also trying out the new Llarowe holos that just came out. I was all sorts of excited and while they are ok, the brush is wonky and the holo is more scattered than linear and I'm more a linear freak. Gee, I'm all sorts of bad news today aren't I? Let's get started shall we? Here is the silly bottle shot. This is Dance Legend Robots vs Humans and Llarowe Burnt Sugar. I told you I'd be wearing the Dance again very soon! I started with Sugar, which is much darker than the pictures depict on the website. I did an accent of Dance. Here are the starting shots. The sun decided to be a beeyotch for this post as well. As you can see, this is a much darker brown and not linear like the Dance. 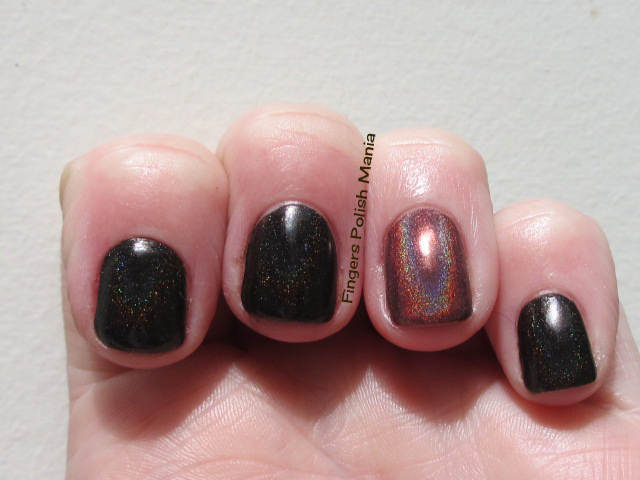 I can't say enough how awful the brush is on these Llarowe holos. Why bother making a pretty polish if you're gonna do a wonky crappy brush? 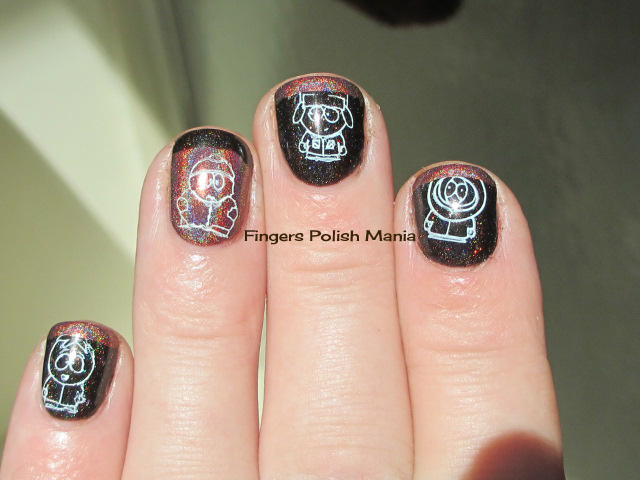 I next tried to stamp with the opposite color, which didn't work at all. So I got out my Sally Hansen Whirlwind White and still these designs have parts missing and not at all the crisp clean lines that they should have. Here is that step. 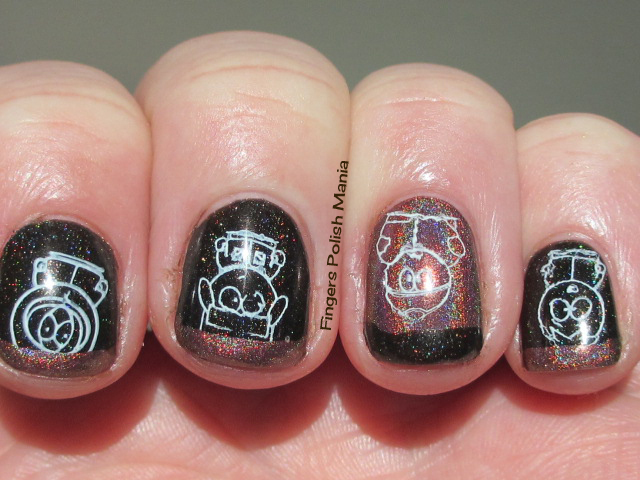 I am not proud of this at all, but I just couldn't get this FUN11 plate to stamp well. FUN2 works just fine. I ended this with my funky. Here are the results. The last picture is my thumb showing the last character in case you were missing him! This is on the FUN2 plate. 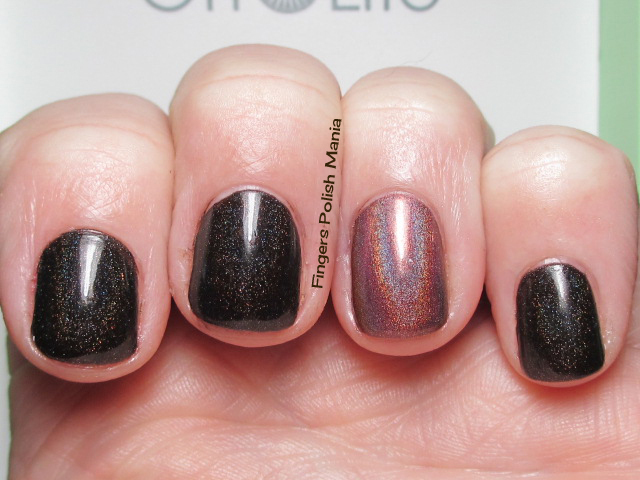 This last picture also shows you that the Burnt Sugar does have pretty holo sparkles and I do love the brown of this, just not total love you know? 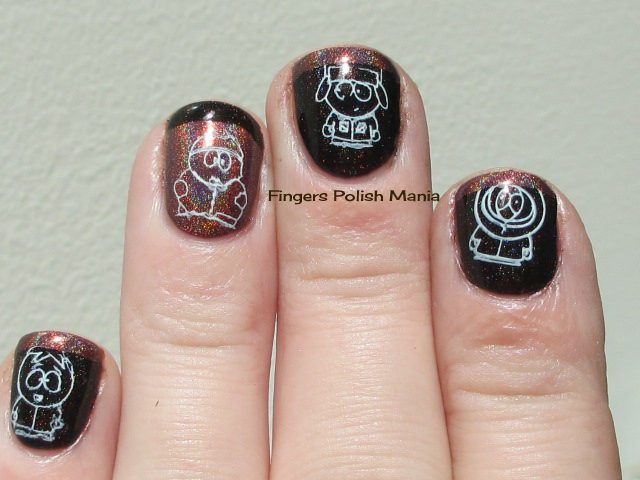 Do you watch South Park?